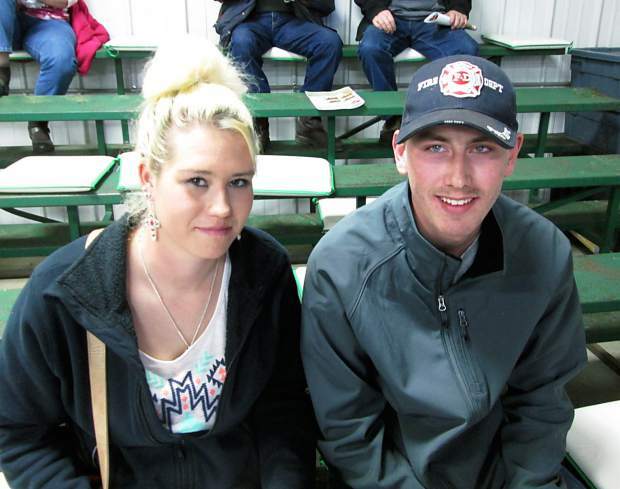 Gus Gran, Winner, South Dakota, with his girlfriend, Kimi Coonrod, bought the top bred heifer at $6,250. 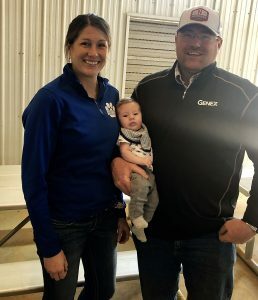 Gary and Sue Pederson, along with Chad and Lisa Pederson are owners of the Broken Heart Ranch, and they hosted a big crowd for Broken Heart’s 38th annual production sale. We were all honored that Ralph Pederson was in attendance at the sale. This beautiful ranch in located northeast of Firesteel, and northwest of Timber Lake in north central South Dakota. The Broken Heart philosophy is “staying consistent” and selecting for a balanced set of traits. They want deep-sided, long-bodied females that are highly maternal with excellent feet and legs. The cows have excellent udders and are nice and gentle. 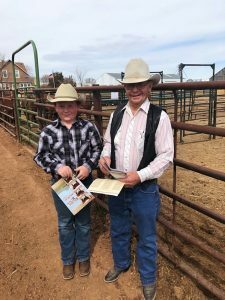 Many long time repeat buyers were packing the seats for this sale, and they bid very competitively to own these good cattle. Hard work and customer satisfaction has never gone out of style at Broken Heart Ranch. 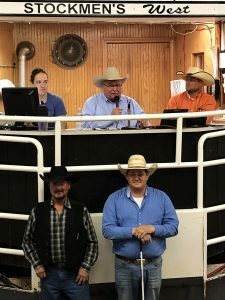 The top selling bull of the day was Lot 2, selling for $14,000 to long time repeat buyer Larry Harrison from White River, South Dakota. He was BHR Thundar 518, a son of Bieber Thundar A489, and out of a daughter of LCC New Chapter who had an MPPA of 107. Born at 80 pounds, he weaned at 741 pounds. He grew to a yearling weight of 1299 pounds, and had EPDs of HB (herd builder) 114, GM (grid maker) 51, CED 5, BW -1.3, WW 72, YW 109, MILK 20, ME 9, HPG 11, CEM 0, ST 12, MB 0.58, YG 0.04, CW 33, RE 0.41, and Fat 0.03. He was deep made, thick topped, and easy fleshing, with lots of growth. Jeff Stradinger from Isabel, South Dakota, chose Lot 10 for $13,500. This son of LSF Rab Catapult Y7004 was out of a daughter of Messmer Hector. He hit the ground at 86 pounds, grew to a weaning weight of 765 pounds, and yielded a yearling weight of 1397 pounds. His EPDs were HB 141, GM 52, BW -1.3, WW 72, YW 109, MILK 20, and MARB 0.68. 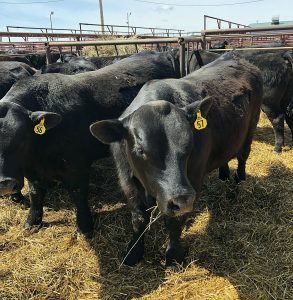 Lot 36 sold for $12,000 to Jason Hulm from Glad Valley, South Dakota. This son of Brown P707 Y7207 was out of a Drifter daughter with an MPPA of 106. With an 80 pound birth weight, he weaned at 786 pounds to ratio 116. His EPDs included HB 152, GM 52, BW -0.3, WW 71, YW 116, MILK 26, and MARB 0.80. Lot 6 sold for $10,500 to Schriefer Red Angus from Golden Valley, North Dakota. He was a son of VGW Bases Loaded 166 and out of a daughter of Bar M Mr. King. With an 83 pound birth weight, he weaned at 801 pounds to ratio 114, and posted an ADG (average daily gain) of 4.05 pounds a day. Otto Red Angus, Grace City, North Dakota, chose Lot 15 at $10,000. Sired by VGW Bases Loaded, he was out of a Knight daughter. He had a 91 pound birth weight, a weaning weight of 737 pounds, and a WDA (weight day of age) 3.56. His EPDs were HB 151, GM 50, BW 0.9, WW 65, YW 105, MILK 15, and MARB 0.56. Steve Landis, Trail City, South Dakota, liked Lot 5, and paid $9,500 to own him. He was by Bases Loaded and New Chapter. Born at 83 pounds, he weaned at 722 pounds, and reached a yearling weight of 1318 pounds. His stats included HPG 13 and ST 16. The top bred heifer sold for $6,250, and was Lot 104. Sired by Bases Loaded, her dam was out of OHRR Dakota Copper 29K. This stylish heifer was AI bred to Feddes Cougar A210 with a calving date of March 18, 2016. 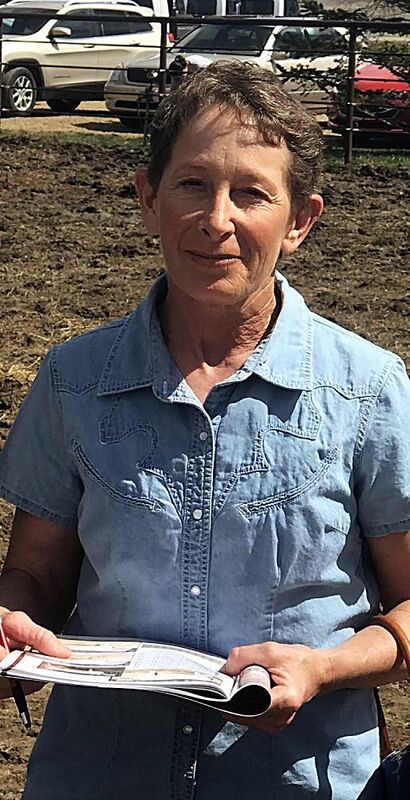 She sold to Gus Gran from Winner, South Dakota. What a beautiful place to visit! It was a very successful day for the Broken Heart crew, but their hospitality and friendship are some of the best.